The 3 to 5 players build Buildings, cultivate Landscapes, and invite artists and scholars to their Palazzi over 7 rounds where they provide them with the facilities which inspire such people to produce great Works. All this is done by the players in their Principalities to earn Prestige points (PP), which are recorded on the fame track. The more impressive a Work, that is, the higher its Work Value (WV), the more money and Prestige the player in whose Principality the Work is created is able to earn. Money is important to acquire more Buildings and Landscapes. Also, the Builders and Jesters, which provide valuable services, expect to be paid. Players will also find that Prestige and Bonus cards have great value in building their reputations and fame. The player who, after seven rounds, has earned the most PP, is the winner! Note: if, during the game, a player's scoring figure passes space 50 on the fame track, he records this fact and continues moving along the track. At the end of the game, such players add 50 PP to the number of points shown by their figures on the track. One player board, which he places in front of himself on the table. The board determines the player's color. The marker, in his color, which he places next to his player board. The figure, in his color, which he places on space "0/50" on the fame track. Players track their scores with their figures. Three Profession cards, in the following way: shuffle the 21 Profession cards and deal 4 face down to each player. From these 4 cards, each player chooses 3 to be his starting hand and returns the 4th. 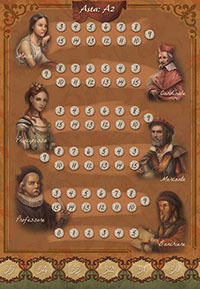 Shuffle the undealt and unchosen Profession cards together and place them face down near the game board as shown below. Note: the number of each type of Freedom tile available is equal to the number of players minus one 1). Place the extra Freedom tiles back in the box. In a game with three players, use only 2 Religion tiles, 2 Opinion tiles, and 2 Travel tiles. Place the black round marker on space "1" of the round/minimum WV table. Place the black starting player figure in front of the starting player (the oldest player) for the first round. The game is played over 7 rounds. The starting player changes from round to round in clockwise order. The game ends after the 7th round. The players bid against each other for objects in the Auction phase. Then, they execute actions in the Action phase, separately, in clockwise order. Central to the Auction phase are the 7 stacks with the different "objects" that are to the left of the game board: Forests, Lakes, Parks, Jesters, Builders, Prestige cards, and Recruiting cards. The different objects give the players who have them specific advantages throughout the game. Each player may acquire, at most, 1 object each round. After a player has an object, he may not bid for other objects in the round. From each stack, only 1 object may be auctioned each round. After an object has been acquired, no more from that stack may be auctioned in the round. When a stack is exhausted, no more of that type may be auctioned. The starting player begins by choosing an object from one of the 7 stacks. By choosing an object, he automatically starts the bidding at 200 Florin. Then, in clockwise order, the players may bid on the object by increasing the current bid by exactly 100 Florin. The starting player must start the bid at 200 Florin - no more and no less. All subsequent bid increases must be exactly 100 Florin - no more and no less. If a player cannot or does not want to bid, he passes, but then may not bid on this objectthis round. The bidding continues, in clockwise order, until all have passed, but one. That player, with the highest bid, pays the bid amount to the Bank (the other players pay nothing), takes the object, and places his marker on the stack. The marker indicates that, for the rest of this round, no object may be auctioned from this stack and this player may not bid on any objects. If the player, who started the auction, is notthe highest bidder in the auction, he chooses another object to auction from those available (objects with markers and empty stacks are not available) and begins a new auction for this object by bidding 200 Florin. The rules for this auction are the same as before. If the player, who started the auction, is the highest bidder in the auction, the next available player (players with markers on stacks are not available), in clockwise order, chooses an object to auction from those available (objects with markers and empty stacks are not available). The rules for this auction are the same as before. In each auction, all players may bid, except those who have already acquired an object this round (they have markers on the stacks). When there is only one player who has not acquired an object this round (excluding players who passed their opportunity to name an object), he may simply pay the Bank 200 Florin to take any one available object (objects with markers and empty stacks are not available) of his choice. He is not required to do this; he may pay nothing and take nothing. After all players have acquired objects or chosen not to acquire objects this round, the Auction phase ends and all players take back their markers from the object stacks. Remember: The last player to start an auction in the Auction phase, does not start an auction, but may take any available object for 200 Florin! In a game with four players, Anna is the starting player. She names a Park and she gets it for the base price of 200 Florin, as all the other players pass instead of bidding. She takes and places a Park and places her marker on the Park stack. This shows that the Park stack is unavailable for later auctions this round and that Anna is not allowed to bid in later auctions this round. #Bob is the next player in clockwise order and chooses to auction a Jester. Chris is also interested and bids 300 Florin. David also wants the Jester and bids 400 Florin. Now it is Bob's turn again (remember, Anna cannot bid) and he raises the bid to 500 Florin. Chris raises the bid to 600 and David to 700. Bob and Chris both pass, allowing David to win the auction. David pays 700 Florin to the Bank, takes a Jester, and puts his marker on the Jester stack. Bob may again choose the auction object as he did not win the last auction. Only he and Chris may now bid. Bob chooses a Forest and Chris raises the bid to 300 Florin. Bob raises the bid to 400, Chris to 500, Bob to 600, then Chris passes. Bob takes and places the Forest, pays 600 Florin to the Bank, and places his marker on the Forest stack. Now only Chris may bid. She may choose freely from the four remaining stacks: Lake, Builder, Prestige card, or Recruiting card. She takes a Builder and pays 200 Florin to the Bank. After Chris finishes, Anna, Bob, and David take their markers back. each object gives its specific advantages only to the Principality it is in! a player may have as many of each object as he can acquire, except that each player is limited to 3 Builders. Of the 21 artists and scholars (the Professions) nine want Forests for their recreation. When one of these 9 Professions completes a Work in the Action phase and there is at least one Forest in the Principality where the Work is completed, the WV for that Work is increased by 3. When a player places a second Forest in his Principality (he need not place it adjacent to the first), he scores 3 PP. He moves his figure 3 spaces forward on the fame track. When a player places a third Forest in his Principality (he need not place it next to either of the other two), he scores 3 PP, and so on). Lakes are used in the same way as Forests. The difference is that Lakes are smaller and attract only 7 of the Professions to them for recreation. Parks are used in the same way as Forests. The difference is that Parks are smaller and attract only 5 of the Professions to them for recreation. A Jester, through his entertainment, brings relaxation to the artists and scholars. When a player acquires a Jester, he places it on his Palazzo. 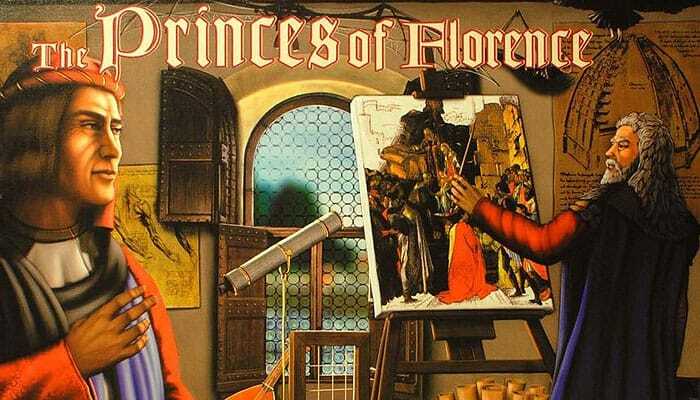 Each Jester in a Principality increases the WV of a Work completed in that Principality by 2. When a player acquires a Builder, he places it in the left-most builder space on his player board. This player only pays 300 Florin (instead of 700) to build a Building (see "Build a Building" for more information). When a player acquires a second Builder, he places it in the middle builder space on his player board. The player may now build buildings adjacent to each other (see "Build a Building" for more information). When a player acquires a third Builder, he places it in the right-most builder space on his player board. The player now builds Buildings for no cost. When a player acquires a second Builder, he earns 3 PP. When he acquires a third Builder, he also earns 3 PP. When a player wins an auction for a Prestige card, he takes the top 5 cards from the Prestige deck (all cards if there are less than 5), chooses one and places it face down next to his player board. He then places the other four cards face down at the bottom of the Prestige deck in any order he chooses. Depending on the cards, a player who acquires a Prestige card may earn up to 8 PP for each card at the end o the game. To earn the points on a Prestige card, the player must fulfill the requirements listed on the card in his Principality at the end of the game. Many of the cards require a player to be the only player to fulfill the requirements to earn the full PP. If the player ties with others, he would earn only half the points. For example, Bob holds the card, "For the most buildings you earn 6 PP (3)". He earns 6 PP if he is the only player with the most buildings in his Principality. If he ties with one or more other players, he earns 3 PP. Of course, if Chris has the most buildings, Bob earns 0 PP. by taking a Profession card in the Action phase. When a player acquires a Recruiting card, he may use it immediately or later. To use a Recruiting card, a player chooses any face up Profession card on the board (from any opponent)3), takes the card into his hand, and places the Recruiting card in its place on the board. If the player chooses to use the Recruiting card later, he takes it into his hand and may play it anytime during his turn in the Action phase of any round 4). The player may use the recruited Profession card to complete a Work immediately or in a later round (see "Complete a Work" for more information). Note: a Recruiting card counts as a Profession card and adds 1 WV to each completed Work (see "Complete a Work" for more information). It also counts as a Profession card for all Bonus and Prestige cards that mention Profession cards. In the Action phase, each player, in clockwise order beginning with the starting player, may execute two actions 5). On his turn, a player completes his first action and then completes his second 6). A player may not start one action and interrupt it with the second action. Completing a Work, building a Building, and acquiring a Bonus card may each be done by each player once or twice per round in the Action phase. Introducing a Freedom and taking a Profession card may each only be done by each player once per round in the Action phase. A player may complete a Work by playing the Profession card from his hand for the artist or scholar completing the Work. The value of the Work must equal or exceed the minimum value shown in the round/minimum WV table. This value increases from round to round as seen in the table). He takes the appropriate Profession card from his hand and lays it on the table next to his player board; the artist or scholar represented by the card completes a Work. Note: the player leaves the card face up next to his player board, but may not complete another Work by this person 8). 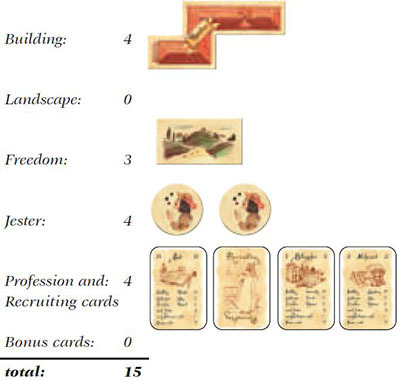 However, another player could recruit this Profession card and use it to complete a Work in his Principality. The sum of all the above is the Work's WV. The player places his marker on the fame track on the space that matches the WV points he earned for the Work (e.g. WV 15 = space 15). The player does not score the WV as PP. Reminder: the WV must be at least as high as the minimum WV for the round! Otherwise, the player may not play the Profession card and the Work may not be completed! The player earns money from the Bank for a completed Work. The Bank pays 100 Florin per WV (e.g. WV 15 = 1,500 Florin). The player may immediately (but not later) take some or all of the payment for this Work (but not more) in PP rather than money. The exchange rate for this is 200 Florin = 1 PP. If a player chooses to do this, he immediately returns between 200 Florin and the full amount of the payment to the Bank and then moves his scoring figure the appropriate number of spaces forward on the fame track). Note: the player may only convert the money just earned for a Work to PP and must do it immediately. A player may not convert any of his other money to PP. Therefore, a player must think carefully about how much he wants to convert! The players leave their markers on the fame track until the end of the Action phase. They do not score the Work's WV by moving their scoring figures on the fame track. After all players have taken their turns in the Action phase, the player with the best Work scores 3 PP. Note: when a player completes two Works in a round, he places his marker on the fame track space for the Work with the higher WV, not the sum of the two! In round 3 (minimum WV = 12), Anna chooses to complete a Work with a Poet. She places the Poet Profession card from her hand face up onto the table next to her player board. In her Principality, she has a Theater, a Travel Freedom tile, and 2 Jesters. She also has 4 Profession cards (including the Poet she just played and a Recruiting card) on the table and in her hand. She has no Lake in her Principality and plays no Bonus cards. She places her marker on space 15 of the fame track.Anna takes 1,500 Florin from the Bank. She decides she does not need the money at this time and so exchanges money from the Work for the most possible PP: she returns 1,400 Florin to the Bank and moves her scoring figure 7 spaces along the fame track. It immediately earns the player 3 PP. It may add to the WV of a Work, by adding 4 points to the WV of a Work, when the artist or scholar prefers to work in this Building. A player pays 700 Florin to build a Building regardless of its size: large, medium, or small. When a player has 1 or 2 Builders in his Principality, he pays only 300 Florin to build a Building, regardless of its size. When a player has 3 Builders in his principality, he pays nothing to build Buildings (see "Builder" for more information). When a player builds a Building, he pays the building cost to the Bank, takes the Building from the supply, and immediately places the Building in his Principality. If the Building a player wants to build is not available in the supply, he may not build that Building. The player may place a Building (or a Landscape) in any orientation on the grid, but must place it completely within the grid. As the pieces have two sides, the player may place them either side up. The player may not place a Building (or a Landscape) so that it overlaps, even partially, another Building or a Landscape. A player may not place a Building directly adjacent to another Building. Buildings may touch, at most, at their corners. This rule applies also to the Palazzo. When a player has 2 or more Builders in his Principality, he maybuild a Building directly adjacent to another Building! A player may build a Building (or Landscape) directly adjacent to a Landscape. A player may build each Building only oncein his Principality. Once a Building (or a Landscape) is placed in a Principality, the player may not move or demolish it during the game. 1 violates rule 1: not within grid. 2 violates rule 2: overlaps another Building or Landscape. 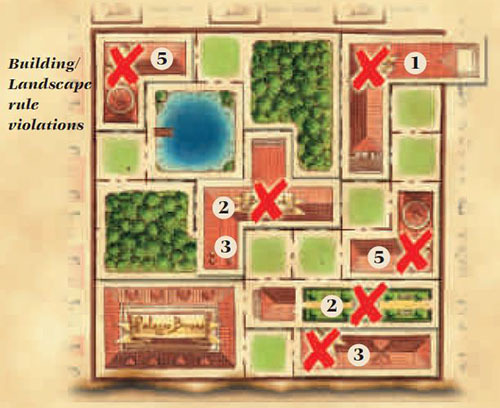 3 violates rule 3: adjacent to another Building or the Palazzo (assuming that the player does not have 2 or 3 Builders). 5 violates rule 5: two of the same Building (the second tower could not be placed). When a player wants a new Profession card, he pays 300 Florin to the Bank, draws the top five cards from the Profession card deck (all cards if there are less than 5), examines them, picks one card, and adds it to his hand. The player places the unchosen cards, face down, in any order he chooses, on the bottom of the Profession card deck. The player may use this card to complete a Work, either in this round if he has an action left or in a later round. When the Profession deck is exhausted, players may not select this action. The artists and scholars are more comfortable living in a Principality that offers certain Freedoms: Travel, Opinion, or Religion. They are also motivated to produce greater Works in such circumstances. The specific Freedom important to an artist or scholar is listed on his Profession card. 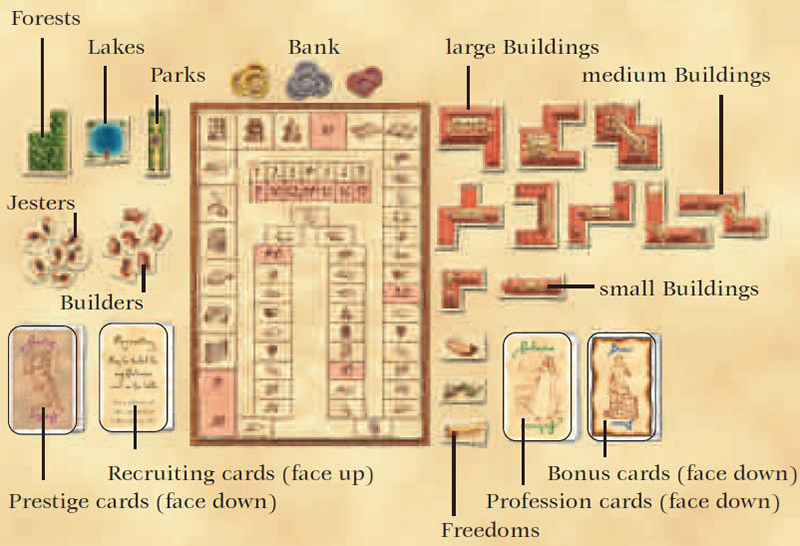 When a player wants to introduce a Freedom to his Principality, he pays 300 Florin to the Bank, takes the Freedom tile he wants from the supply, and places it in the appropriate space on his player board. This Freedom increases, in this Principality, the WV of a Work by 3 points if this Freedom is the one important to the artist or scholar completing the Work. 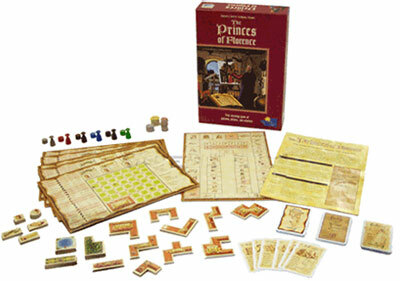 A player may only introduce each Freedom once to his Principality. If the Freedom a player wants is not available in the supply, he may not introduce it to his Principality. Players may use Bonus cards to significantly increase the WV of a Work. When a player wants a Bonus card, he pays 300 Florin to the Bank, draws the top five cards from the Bonus card deck (all cards if there are less than 5), examines them, picks one card, and adds it to his hand. The player places the unchosen cards, face down, in any order he chooses, on the bottom of the Bonus card deck. When a player completes a Work, he may also play none, one, or more Bonus cards (even in the same round he acquired the card). This is not a separate action, but part of the "Complete a Work" action. Bonus cards add to the WV of a completed Work. The amount added can be a little or a lot. The amount added is based on how many of the things described on the card the player has. Each Bonus card may only be played once. After playing a Bonus card, the player places it face up next to the game board; it is out of the game! When the Bonus deck is exhausted, players may not select this action. After all players have completed their actions in the Action phase (including those who chose to take less than two actions), the players compare their WV's for the round as shown by their markers on the fame track. The player with the highest WV for the round, scores 3 PP and moves his figure forward on the fame track 3 spaces. If two or more players tie with the highest WV, they all score 3 PP. If only one player completes a Work in the round, he is automatically the highest and scores 3 PP. If no player completes a Work in the round, no one scores the 3 PP for the round. After scoring the best Work, all players who completed Works in the round remove their markers from the fame track. After scoring the best Work, the Action phase is complete. The starting player gives his left neighbor the starting player token. This player becomes the new starting player. He moves the round marker to the next space on the round/minimum WV table and begins the new round. A player earns money for each completed Work: 100 Florin for each WV point (see "Complete a Work for more information). A player may move his figure backward on the fame track at any time during the game. For each space moved backward, the player takes 100 Florin from the Bank. The game ends after the 7th round. The players now score their Prestige cards: each player who has fulfilled the requirements on any of his Prestige cards, scores the appropriate number of PP. The player with the most PP (whose scoring figure has moved furthest on the fame track) is the winner. If two or more players tie with the most PP, the player among them with the most money is the winner. These rules explain how to play with just two players. Players should use the original rules for the game, making only the changes described below. Players can play with two players with the other expansions. 5 freedoms (1 of each type, the other 2 chosen randomly); for a more challenging game, play with just 4 freedoms. Starting bid is exactly 300 Florins instead of 200 Florins. Auction the three landscape types (forest, lake, and park) as one item. The winner of the auction chooses which he wants. The other player cannot choose to bid on another landscape this round.